If somebody asked me what I collected as a child, I would probably be most inclined to say Tazos, everything and anything Barbie related and my undying love for Polly Pocket was near borderline obsessive. My 90s childhood was full of glorified plastic tat, and of course brought me, much joy and happiness. 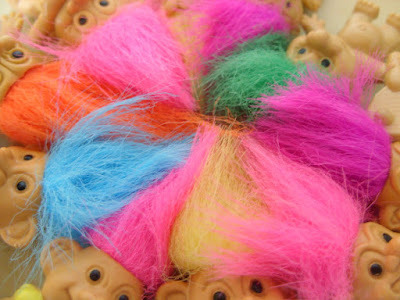 So when stumbling upon a box of my old stuff I was somewhat quite mortified to discover an army of Trolls. Now I do remember the odd Troll here and there, but nowhere near as many as this lot. I think they must have secretly been multiplying whilst they’ve been packed away all this time. What I just can’t get my head around is the fact that at some point in my childhood I must have played with these (a memory I seem to have now erased), not only have they got wacky and unruly hair in all shades of neon bright, but they are rather freaky looking too, what with their bare bottoms and ogling eyes. Are we sure Trolls were meant for children? One thing is for sure, my love of free gifts has been quite apparent from a young age, I ate my way through many boxes of cereal in hope of collecting the full set of pen toppers. I’m aware a Troll is supposed to be a mythical creature, but they just don’t quite have the sweet nature appeal of Sylvanian families and other well-loved childhood characters. And Trolls wearing clothes, well that’s a whole other concerning matter. 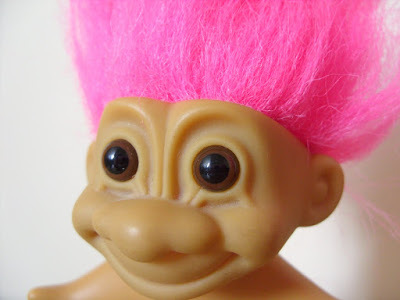 Dressing up Barbie and Ken is one thing, but dressing up a troll is kind of strange…no? The fact that the word Troll is often used as an insult, kind of adds to the dislike for me, even my love of all things kitsch can’t quite stretch this far. But they obviously must have served some sort of bizarre purpose in my childhood. I had some of those too, I seem to remember cutting their hair. Which kid of defeats the purpose when you think about it, because their hair is clearly their best feature! Wow you had a lot! I can't recall ever owning any of them but I remember my friends having them. I love trolls! I still have a couple somewhere. I used to believe the ones with the gem in their belly button had magic powers, lol. Oh my gosh so many trolls! 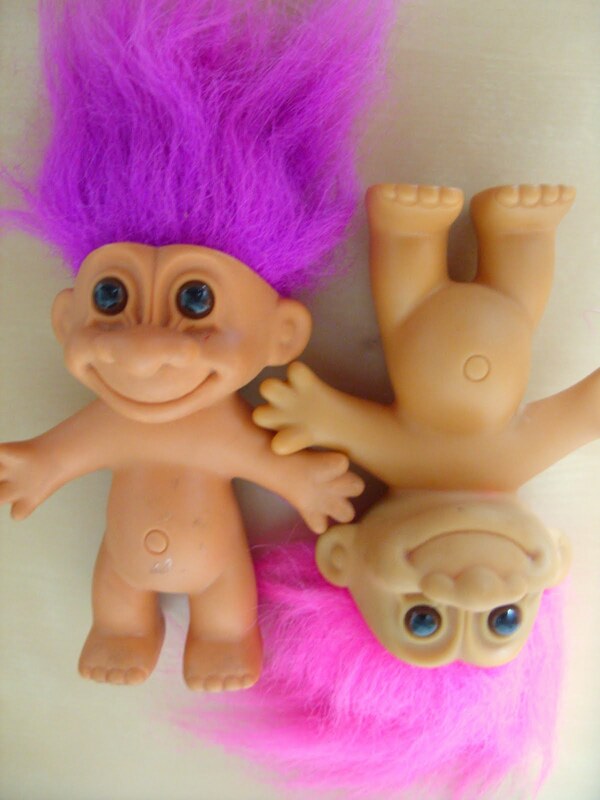 I remember I had ONE troll and it would always really befuddle me that it was naked and I'd always try and put barbie clothes on it hahaha! 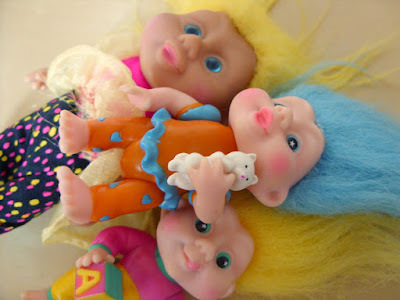 Hahaha - i always love visiting your blog as you nearly always post about something thaty relates to me or things ive bought and yes i was a troll hoarder as a child! I had hundreds and used to ask for them for birhtday presents from the card shop! My husband calls them 'monkey scarers' as we once won one as a booby prize on a game at chessingston world of adventures - we then had it in hand when we went to the zoo part and the poor marmoset monkeys freaked out big time when they saw the troll at the window! This post is hilarious! LOL Alice! I actually have quite a story about these little things, I remember seeing some in a shop and wanting them so bad purely because of the wacky hair. My Mum was quite horrified at this and refused point blank. Haha, your attic is probably full of teeny troll babies, swinging from the rafters and getting into the ceiling. You've started an infestation. 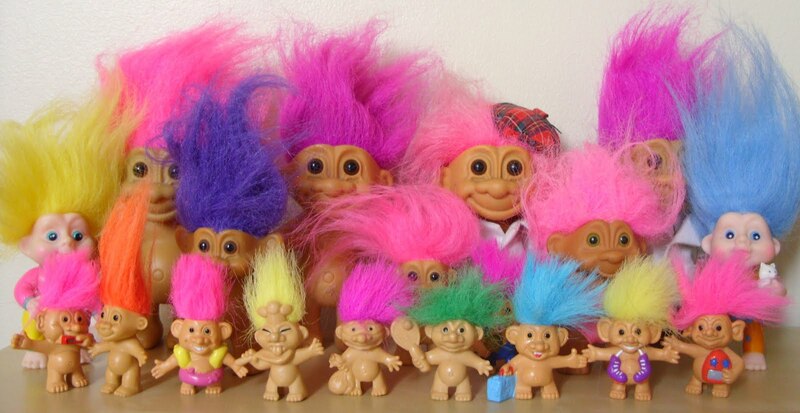 They're probably one of those toys which will never die, come the nuclear apocalypse there'll still be trolls! I don't generally laugh out loud when reading blog posts- thank you for sharing this and making me giggle. Ah yes I remember and was involved in the troll obsession of the 90s!!! Oh wow, I *loved* trolls! You always blog about such amazing nostalgic things, bringing back so many awesome memories! 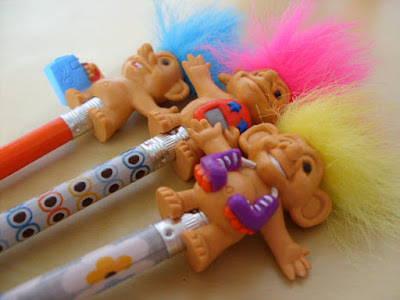 I had the pencil trolls, and an amazing wizard troll which I loved. As being one of four children, I remember there being trolls of every size in the house (and us having to chuck them out!) BUT I can never remember playing with them too....dun dun dun! Me and my sister had trolls, we used to play with the my little ponys at the same time. The game was simple: trolls ponyknapped baby pony, mummy pony went and saved it. Ohhh, they're so cute. I also have 3 of them in my closet.